When I first shuffled through the cards from Munchkin Axe Cop, Dance With Baby Man went directly into the "must use for sneak peek" pile. 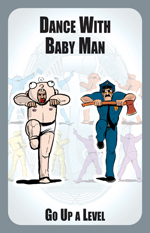 It may be just a GUAL (Go Up A Level) card -- although you'd never say "just" during the game -- but the idea of Axe Cop and Baby Man doing some sort of dance routine sets off a mini-giggle-fest inside my head every time. Dance With Baby Man can be found with many other GUAL cards in Munchkin Axe Cop, available this fall in game stores everywhere.